Growing light starting become popular among plant growers, lovers or farmers for cultivating in a greenhouse or inside the house/ tent. 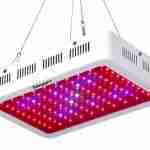 There are many kinds of growing light available in market varying size, power, capacity, and other features. Some of them are good some of are not that impressive. Not only the power, it is also the matter of that the kind/size of canopy or room you are going to use for growing indoor plants. The important thing is the rays that need to a plant grow. If your panel can provide that in proper amount for proper time- any brand of grow light is fine. In most cases, people buy grow-light for personal use in small areas. Small to the mid-size of panels in between 100-500w is fine this kind of application. Does the light cost cut on the energy bill compared to a digital ballast? How hot does the grow light get? 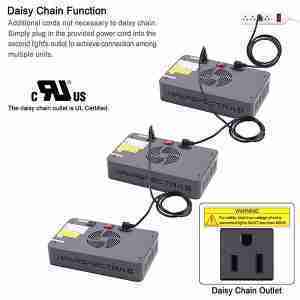 Is daisy chain is included with the light? What is the real consumer of the panel 136 or 300 watts? What is the distance should maintain from the plants? What size of the tent should recommend for 2 of these lights? What type of outlet the light is require? 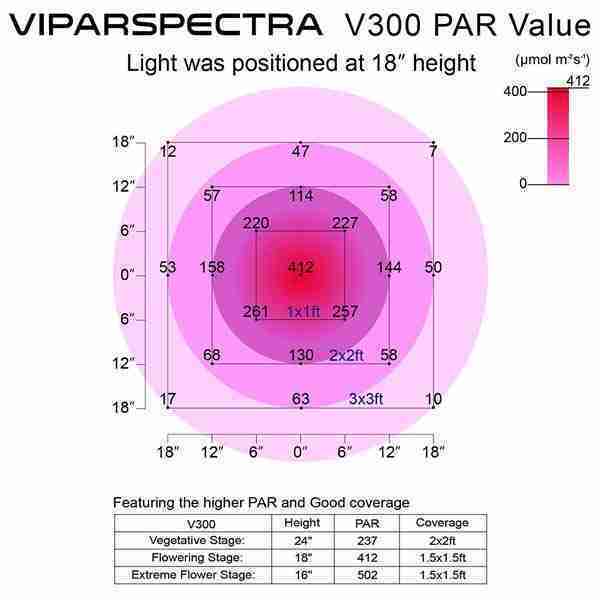 In this VIPARSPECTRA 300W LED Grow Light review I am going to discuss different sides of it so you can better understand it and analyze the good and bad things about it. So, let’s start. 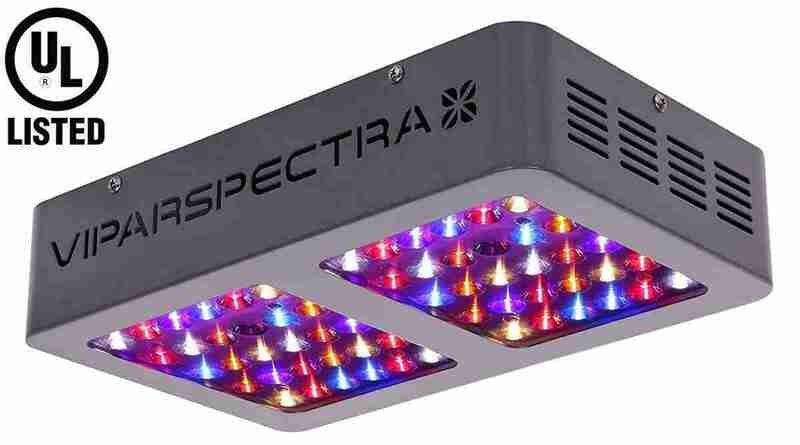 VIPARSPECTRA 300W LED Grow Light is engineered for beginners. But it’s not that cheap or nor useless. It’s affordable but the parts used in the light-panel is good in quality. That is why you can be assured about its durability. It does not consume that much power like other grow lights. So, for the long run, you don’t need to spend that much money using one or two growing light of VIPARSPECTRA series in your grow tent. This best growing light provides a full spectrum that you must need to grow your plants. This LED light includes UV to IR rays. So, you can get all types of rays to grow and bloom indoor plants at all growth stages. The PPFD of the light arrives at the plants depending on the height setup. If you maintain the proper height with exact duration; the maximum numbers of photons fall in the surface of plants each second. The full form of PPFD is photosynthetic flux density. It’s the measurement of specific spot location on the living tent/box/room. However, during our test with lettuce, strawberry and mint pots. The leaf growth was satisfying and the strawberry starting to bloom flowers during this time; now we have to see what would be a performance on fruit quality and quantity. The good thing about this grows light series is, its daisy chainable. You might not find other this price range of grow-light with this capability. And it saves a lot of trouble hanging. The V300 is more user-friendly and adjustable to place on different height level. The light panel is made of reliable yet durable Bridlum/piles, LEDs, sturdy board, fan unit, etc. The upgraded aluminum cooling heat sinks are a great addition for decrease the temperature. Infect, comparison to the parts and settings the price is astounding. If you use it single-handedly, the possibility is, you could use it for years after years. No matter how small or big the size of your grow light panel is the main things that matter most are, how it performs as a growing light. And that depends on different parts, features of it. 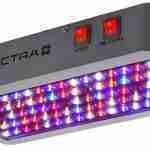 Here is a short Viparspectra 300w led grow light review with its feature details. Ideal for newcomer home plant growers. High intensity and full spectrum as natural sunlight. Three different light options allow you to customize light control base on plant types. Daisy chain capability gives more advantage over extended areas. Low power consuming capability reduce extra electricity bill. Large scale grower may feel the light is very small by its size. Contains Gallium Aluminum Arsenide (which is the part of making LED’s). It’s very toxic compound and could harm people with sinus problem even animal of your house. It’s better to limit your time around it. Yes, it’s really energy efficient and low cost. It does heat the grow tent. You need to leave the fold open to let air out to control the extended heat. No, but it has daisy chain capability. Minimum 4 to 6 inches. One light can cover 16 sq. ft. So, for 2 of these, you should go for 32 sq. ft. of the tent. 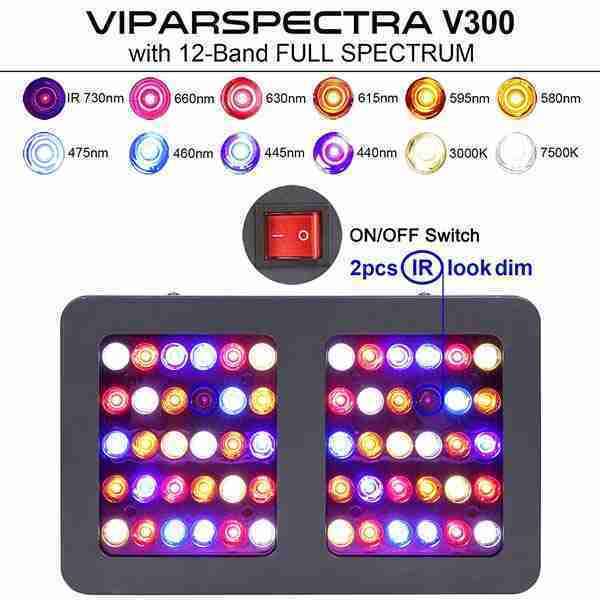 So, I think throughout my Viparspectra 300w led grow light review I have shared why this increased light become so popular. First of all, it’s a non-complicated light, easy to setup and use. That is why it is easier to use a beginner. Moreover, the light is scientifically designed to maintain the balance of PAR/Lumen work and coverage. Importantly, the light has a full spectrum that increases the vegetable and flower growth among every stage. And that is what you also want to see or pay for. It easily covers 1/2 by 2 ft. area at 24 inches max. In addition, it has speed but quite cooling fans that control the heat and maintain a proper moisturization. So, after all the discussion I hope you get one of this light soon with the help of Viparspectra 300w led grow light review. Till then happy growing!